Based on reviews from 64 experts and 1,590 users. 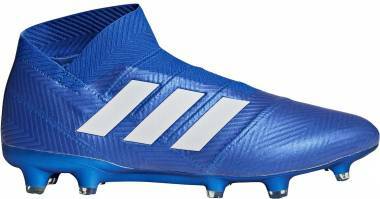 Learn how our rankings work or see our guide to laceless football boots. Updated Apr 2019. As the game of football tremendously evolved over time, so did the design of football boots. Shoe enthusiasts who know their history could attest to that. The earliest shoes made for the sport were stiff and heavy, with large metal studs to add to the overall aesthetic. As shoe brands like Puma and Adidas emerged, their technologies improved the look and functionality of football boots, in general. 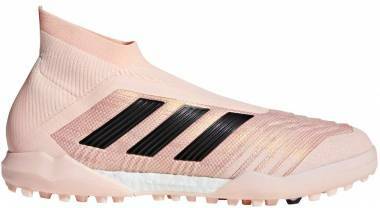 Moreover, as newer manufacturers and better innovations came, the highly functional soccer cleats went on to become more lightweight, wearing bolder designs and introducing amazing features never seen before. One of the most groundbreaking developments in football shoe manufacturing is the arrival of laceless football boots. Who would have imagined that there would come a day when athletes would set foot on the pitch wearing shoes that had no laces? Apparently, there is no stopping manufacturers from devising newer innovations that elevate the performance and quality of modern football boots. Why go for laceless soccer cleats? Aside from a sleek look, there are more things that a player can benefit from laceless football boots. Here’s a quick lowdown on the advantages of wearing laceless football boots. Excellent fit. With the absence of laces, shoe design leans towards using materials that will enhance the boot’s fit. At least, that is the case in Adidas laceless football boots. 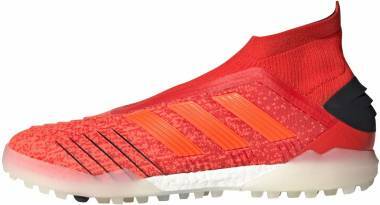 With the Primeknit upper, wearers are assured of a sock-like wrap around the foot. Additionally, players won’t need to be bothered by having to adjust their laces ever so often. Expanded contact zone. Athletes often complain that laces sometimes interfere with the impact of their strikes. With laceless football boots, this issue is addressed. Moreover, there is a larger surface area that can be used to maneuver the ball, improving touch and control. Enhanced ball control. As a result of the sock-like fit of the upper material, ball touch is consequently improved. With the upper feeling like a player’s second skin, uncompromised ball feel is achieved. This leads to optimal ball control that can make a significant difference when at play. Now if there is a good side to having laceless football boots on the pitch, critics would reveal that there is also a bad side to it. Here are some disadvantages of using laceless football boots. Difficult to put on. According to those who have tried using laceless football boots, it can be quite a struggle to wear, especially when one is accustomed to laced-up boots. Without the laces to help loosen the fit, wearers will need to squeeze the foot in the shoe with the help of the pull tabs. Issues about fit. Fit preference is different for every user. As much as most laceless soccer cleats are designed to offer a snug fit, those with wider feet might not find this favorable. On the other hand, wearers who desire a tighter fit will not have the option to make any adjustments as there are no laces. 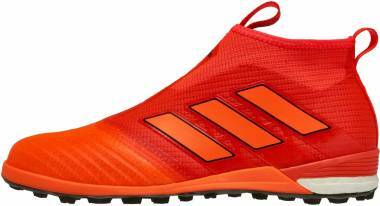 The Three Stripes has a quite a solid line-up of laceless soccer cleats in each of their silos. Here are some of their most noteworthy contenders. Following the hype about the brand’s initial laceless football boot release, this second generation boot sure does not disappoint. Meant to be an upgrade to the Ace 16+, the Ace 17+ Purecontrol soccer cleats sport new features that are intended to improve the boot’s overall performance. 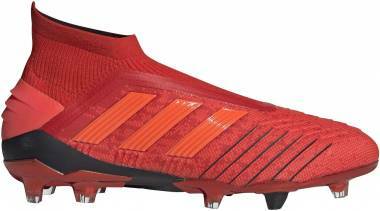 Adidas has fitted this boot with an upgraded midfoot using the Controlskin. Although stiffer, this layer hugs the foot better. It’s thin enough to offer a barefoot feel but thick enough to protect the foot. 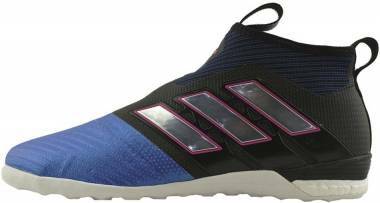 Some features were retained though, like the Primeknit, which covers the vamp, and the SprintFrame outsole that provides excellent traction and stability. The recently released Adidas soccer cleats from the X series have gone full laceless. The Adidas X 18+ Purespeed soccer shoes replace the X 17+. 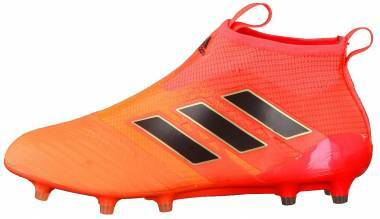 These laceless football boots have visible F50 adizero roots, but its innovative features take it to the next level. Aside from the absence of laces on the midfoot, this model also sports a new low-cut Claw collar that utilizes a new stretch material to lock in the foot. Another innovative detail is the Skeletal weave upper that allows for a responsive touch and a lightweight feel. Moreover, the Speedframe sole of this football boot has been updated with Drillium-engineered tooling alongside a more minimalistic construction. Designed for agility on the pitch, this new generation laceless football boot takes inspiration from the archives. 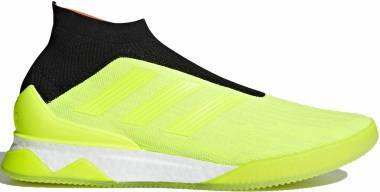 Featuring the previous Torsion technology of Adidas, the laceless Nemeziz 18+ from Adidas shows off an aesthetically impressive design with much functionality. Among the unique features of this boot is the 360 Agility Bandage, which consists of revolutionary torsion tapes that provide support and stability on the foot. An Agilityknit heel and forefoot also allow for enhanced responsiveness and ball control. The brand has also equipped this football boot with FG+AG studs that make it suitable for both natural grass and artificial turf pitches. 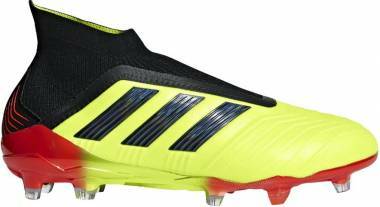 The Adidas Predator line has produced several all-time favorite boots, and the laceless Adidas Predator 18+ is a worthy successor. 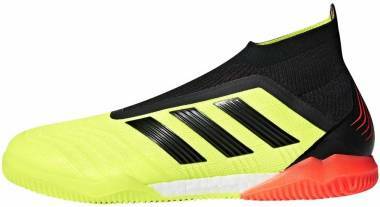 This modern laceless football boot utilizes the Power-spin technology that works to enhance ball control. The upper of this shoe is mostly made of Primeknit. However, the midfoot highlights a new technology called the Forged knit, a more structured variation of the Primeknit. This new material is shaped to offer both lateral and medial stability without using any cage or tongue—additionally, the shoe sports the Stretchy Sockfit collar, which functions as an elastic support for the Purecut laceless design. Leave it to Adidas to come up with a revolutionary technology that sets the pace of the game when it comes to boot manufacturing. The company is certainly no newcomer in the aspect of innovation. 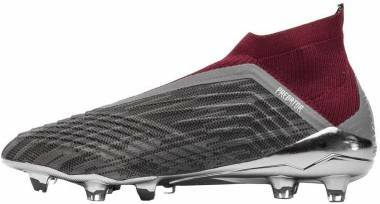 Being the first to introduce football cleats with interchangeable screw-in studs, the German brand sure knows what it is doing; hence, the reason why it has remained among the top brands in football. In 2016, the Three Stripes unveiled one of their greatest contributions to the sport - a shoe made entirely without laces. 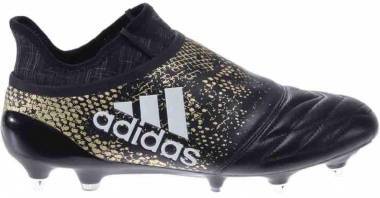 The Ace 16+ PureControl from Adidas was deemed as the “pinnacle of football boot technology” being the first laceless football boot created by the brand. It is worth mentioning though that Adidas was not the first to manufacture laceless football boots. A few years back, Italian company Lotto came up with the very first laceless boot - the Zhero Gravity. However, its arrival was not as celebrated as the Ace 16+ PureControl. 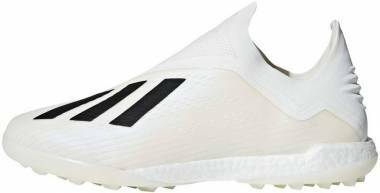 Being the innovators that they are, Adidas has found a way to eliminate the laces on a football boot while maximizing a close ball touch the way athletes wanted. 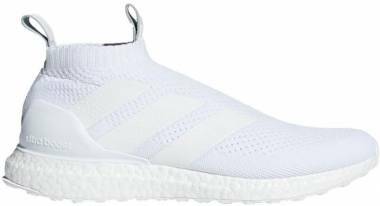 They executed it using their famous Primeknit, an upper material known to give a form-fitting wrap around the foot and a perfect balance of touch and comfort. To make up for the lack of laces, the brand fitted this boot with an internal knit support system. This detail helps anchor the foot in place, so it doesn’t slip. Though not necessarily a technology and technique that can be appreciated at first glance, this feature is vital in the success of the Ace 16+ PureControl. Adidas definitely takes the lead in the laceless football boot game. The coming years saw the advent of more laceless designs from the brand, featured in their different silos. From the way things look, laceless football boots are definitely here to stay. Aside from Adidas and Lotto, is there another brand that offers laceless football boots? While the previous discussion focused more on Adidas laceless football boots, there is actually another brand that also has a laceless offering. English brand Umbro has also come up with a laceless football boot release from their Medusae line. The Medusa 3 Elite is the first laceless leather boot produced to date. Staying true to the Medusa standard, this football boot keeps its super soft leather upper and sticks to the traditional colorway. It sports a one-piece upper with an engineered knitted collar to provide easy foot entry. The base of this shoe features an upgraded sole which was previously seen on the Velocita 4. It relies on stud shape and positioning to achieve optimal grip, traction, and comfort. However, this laceless football boot is a limited edition release. Only 24 pairs were released in each country as cued by Umbro’s foundation in 1924. Has Nike released a laceless football boot model? Technically, Nike has no laceless football boot release to date. However, the Swoosh has managed to join in on the hype by coming up with a technology that gives players an aesthetically laceless upper without actually eliminating the laces. Utilizing what they call a ghost lacing system, Nike was able to conceal the laces, covering it with an outer sleeve to provide a larger strike surface similar to that of an actual laceless boot. This unique lacing system tightens with one pull giving a more personalized fit, which is a slight advantage from boots that have no laces. Among the most sought-after Nike football boots that have this feature are the Nike Phantom VSN Academy DF FG/MG and the Nike Phantom VSN Elite DF SE FG.